Unlike most consultants however, Binchy wasn’t paid. Instead, he received a photo with the cast – a perhaps only slightly less patronising version of a smiley face sticker, a symbol which Binchy’s’s own production, The Misfit Analysis, references to great effect. Why, in fact, disabled characters – or indeed any characters – are rarely played by disabled actors is one of the key concerns of Access All Areas – a Hackney-based performance company for adults with learning disabilities. I met Access All Areas producer Patrick Collier and Cian Binchy on the rooftop of the Lyric Hammersmith, where they were previewing The Misfit Analysis before its run at the Edinburgh Fringe Festival. The production, a collaboration between Binchy and Access All Areas, is an attempt to both educate and challenge perceptions about life with autism. Perceptions like: “you’re autistic therefore you’re like Rainman or Who’s Eating Gilbert Grape?”, Collier adds. Along with various performance programmes for adults with learning disabilities, Access All Areas runs a Performance Making Diploma at the Royal Central School of Speech and Drama. Binchy is a graduate from this course and sings its praises; The Misfit Analysis was his final project. Other courses at ‘community colleges’, he says, had frequently been demeaning and dull. 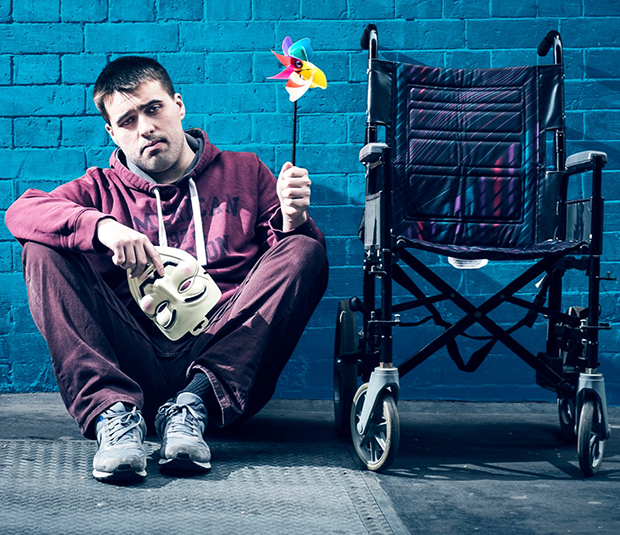 Binchy believes that the performance industry, while ostensibly “glamorous and sugar-coated”, is in fact a “very, very cruel place” – for anyone; and that people with learning disabilities are even more vulnerable to its harsh vagaries. “What do you hope people will gain from seeing your performance?” I ask. Binchy ponders for a while and responds wryly: “I was going to say that it’s about showing people that there’s nothing to be scared of, but I don’t think the play really shows that – I think it shows pretty much the opposite really!” We laugh. Comedy is a crucial tool in Binchy’s work. “I love doing satire and making it seem dead serious,” he tells me, “anything but comfortable; the audience are going to think ‘oh my goodness, what have I got myself in for?’” We laugh again, and Collier and Binchy go off to begin rehearsing.